Brandon Ellert joined the firm as an Associate in 2014 after working with John at HBM Holdings as a Corporate Development Summer Associate. He is responsible for sourcing, evaluating, and executing M&A transactions. Previously, Brandon served as a senior consultant with Navigant Consulting in the corporate finance group where he specialized in troubled financial institution mergers, illiquid securities transfers, and intellectual property analysis. Prior to this, Brandon served as a senior analyst for the middle-market investment banking firm, Brown Gibbons Lang specializing in industrial M&A and restructuring. 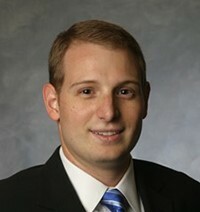 Brandon earned his MBA from Washington University in St. Louis. He completed his undergraduate degree at Indiana University, where he earned a BS in Finance from the Kelley School of Business.